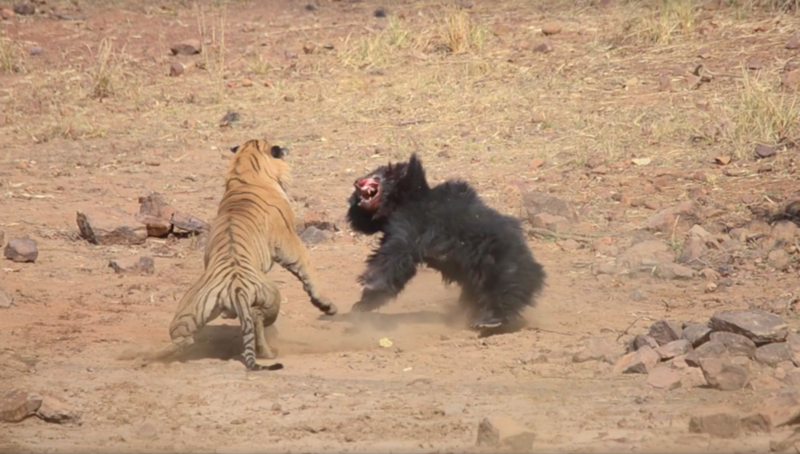 The battle between a male tiger and a female sloth bear in India’s Maharashtra was captured on film. The violent footage makes for tense viewing. The epic fight happened at Tadoba National Park in Maharashtra on Wednesday. The video was shared by the Bamboo Forest Safari Lodge in Tadoba and filmed by naturalist Akshay Kumar. The video shows the tiger spotting the bear and pursuing it through the trees. The bear and tiger then face each other and start to fight as one of the bear’s cubs looks on. The two roll around in the bush as they struggle. The tiger appears to be getting the better of the bear, catching her with his paws and biting at her body. The pair then break apart and go head to head, before wrestling on the ground and biting one another’s heads. The tiger again seems to have overpowered the bear, and digs his teeth into the animal’s neck as she struggles to break free. Eventually, she does and chases the tiger away. The pair clash again, each baring their teeth, before the tiger runs into the water to escape the ferocious bear. Kumar told NDTV the tiger is a seven-year-old called Matkasur, who had marked the water as his territory.